A federal lawsuit filed Thursday in Indiana argues many of the state’s abortion laws are unconstitutional, in the latest test of the strength of the abortion rights win in Whole Woman’s Health v. Hellerstedt. Advocates are challenging five categories of Indiana abortion laws. Fresh off filing a lawsuit seeking to undo a web of Virginia anti-choice restrictions, reproductive rights advocates in Indiana filed a federal lawsuit Thursday challenging laws they claim place ideological opposition to abortion rights above patient health in the Hoosier state. The lawsuit, brought by attorneys on behalf of Whole Woman’s Health Alliance and All-Options Pregnancy Resource Center, challenges dozens of Indiana abortion restrictions they allege impose medically unnecessary burdens on patients, require doctors to lie to their patients, and have led to the closure of clinics across the state. Advocates are challenging five categories of Indiana laws. 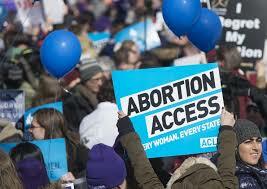 The first are targeted regulation of abortion providers laws or TRAP laws. Those laws, among other things, mandate that abortion providers have admitting privileges at a nearby hospital, require licensing that applies only to abortion clinics, and mandate that only physicians perform abortions. The lawsuit challenges laws that advocates claim deny abortion patients the benefits of scientific progress. These include restrictions on medication abortion and telemedicine restrictions, as well as Indiana’s forced 24-hour waiting period and its requirement that doctors provide patients state-mandated, scientifically unproven information about abortion care. Indiana’s parental involvement and judicial bypass laws are also challenged, as are Indiana laws that place criminal liabilities on abortion providers. The U.S. Supreme Court in 2016 struck down several provisions of Texas’ anti-choice law HB 2 in a landmark case, Whole Woman’s Health v. Hellerstedt. Many of the provisions challenged in the Indiana and Virginia lawsuits mirror provisions struck by the Court in Whole Woman’s Health. The lawsuit seeks to have each provision blocked and declared unconstitutional. Attorneys for the State of Indiana have not yet responded to the complaint.